Okay, let's get this out of the way up front - a "Golden Freddy" is not what you think it is, whatever it is that you think it is! Golden Freddy is a special animatronic in Five Nights at Freddy's - a secret, golden colored version of Freddy Fazbear with missing eyes who appears in the office after a certain sequence of events are triggered. His paws are facing palms up. If one looks at the arms, a few wires and parts of the endoskeleton are visible, which share the same coloration as his accessories. His jaw hangs open and his head is tilted to the right. He is also presented in a sitting, slouched position as if he were deceased. 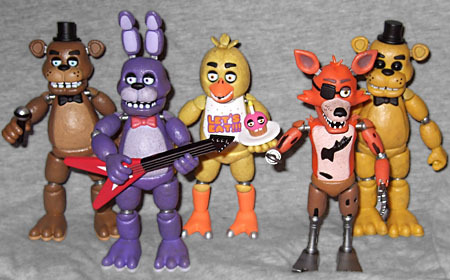 Although a fairly minor character in the first Five Nights at Freddy's canon, Golden Freddy makes sense as the fifth figure in the Funko FNAF line of action figures. He's considered to be one of the five antagonists of the first game, even though realistically he's just a secret, more of a cameo than anything else. He's also a very simple repaint of the Freddy action figure, switching out the bear-colors for his golden look, and painting his eyes entirely, creepily black, to make his eye sockets look empty. Most players of the first FNAF will never see Golden Freddy; getting him to appear involves checking a specific camera and seeing a poster - that strangely changes images by itself - switch to a close-up of Golden Freddy, alongside the creepy laughter of a little girl. When this happens, switching back to the office immediately will find Golden Freddy inside with you, and he will quickly kill you unless you pull down the monitor again, with a creepy image of his face and the words IT'S ME filling the screen before the game crashes to desktop. This unusual appearance and killscreen seemingly comes out of nowhere, making it an excellent twist on the game's existing mechanics and a neat Easter-egg like death that not everyone will encounter. 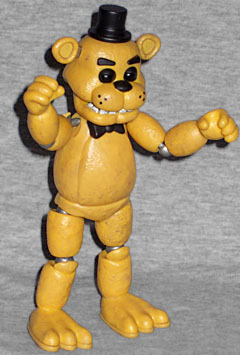 Subsequently the character of Golden Freddy has developed and evolved as the rest of the mythology has, but in this initial game Golden Freddy is simply a repaint of the Freddy animatronic, and with this in mind the Funko action figure is a great repaint of the existing toy. He's a nicely golden-yellow color all over, except for his hat, bowtie and eyes, which run a very pitch black. The effect of the eyes is notable and doesn't quite come across in photos - his eye sockets appear very hollow to great effect - this is a much creepier figure than the original Freddy toy. Articulation is identical to the other figures in this line, with the benefits and the problems. Joints will not break, merely pop out, but they'll pop out way more than you'd like. As before, there's no jaw articulation, and as before this may be the dealbreaker for some. 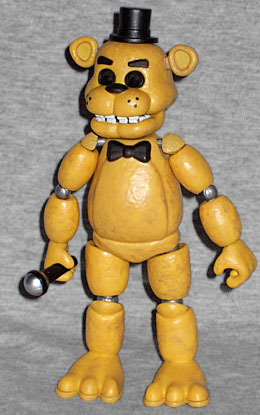 Accessory-wise, Golden Freddy only features his microphone, which is nicely all black except for the metal top, and the standard build-a-figure piece for Spring Trap. So, that's Golden Freddy, another decent toy in the Funko line. If you know what you're getting into with these very reasonably priced figures, positives and negatives, you should find yourself pleasantly surprised with the figures. I've had them on my desk for months now and I still get a kick out of them.